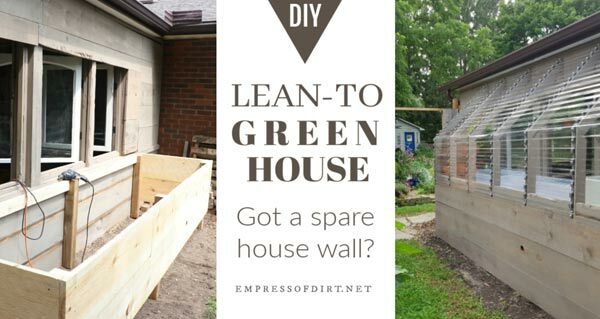 Lean-to greenhouses are a low-cost solution if you have a wall available in the right, sunny location. 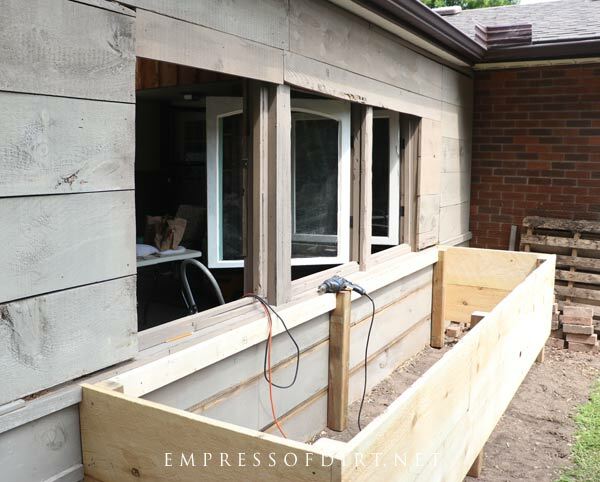 Here we built on the side of a south-facing patio, with the growing space at waist-height for back-friendly gardening. 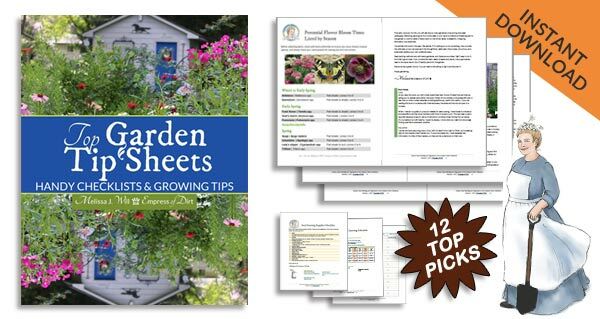 If you are interested in extending your growing season, there are more ideas here plus how to grow vegetables in the winter here. When I decided to build this greenhouse, I started looking online for ways to create a lean-to greenhouse next to a building. My situation is a bit unusual because, instead of accessing the greenhouse from one of the ends, it opens to the inside of the covered patio. And, instead of building it full-height, I opted to create it at table-height for easy access. 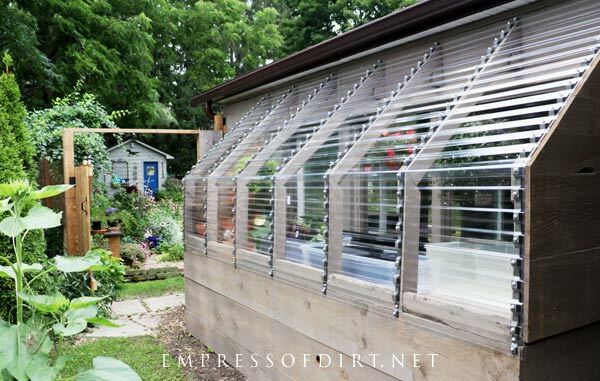 The design is inspired by this barn greenhouse by Ana White which is a freestanding 8×12-foot greenhouse. Mine is 3×12-feet. So, I had to rework the plan to fit my situation. I swear it took longer for me to think through the plan than it did to build the thing! I started out intending to use a bunch of old wood-framed house windows I have leftover from a roadside haul. 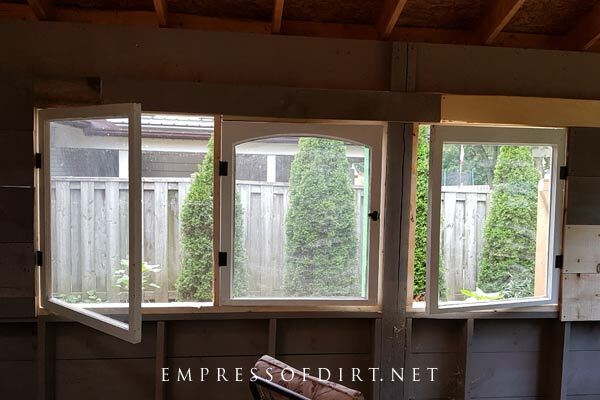 After some thought, I realized that it would be very hard to adequately frame the windows—which are all different sizes and conditions—and get the fairly airtight (and rainproof) space I was hoping for. 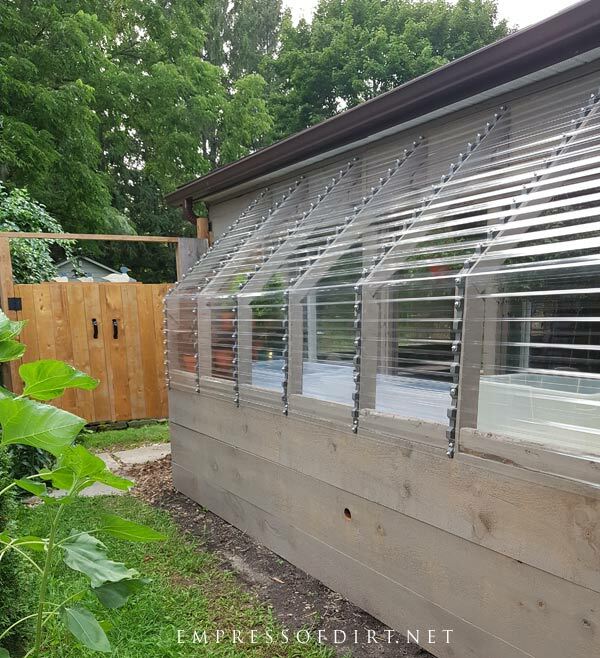 Instead, I used clear 12-foot Suntuf polycarbonate panels for the exterior, and three of the old wood windows for the interior window-doors as you’ll see below. 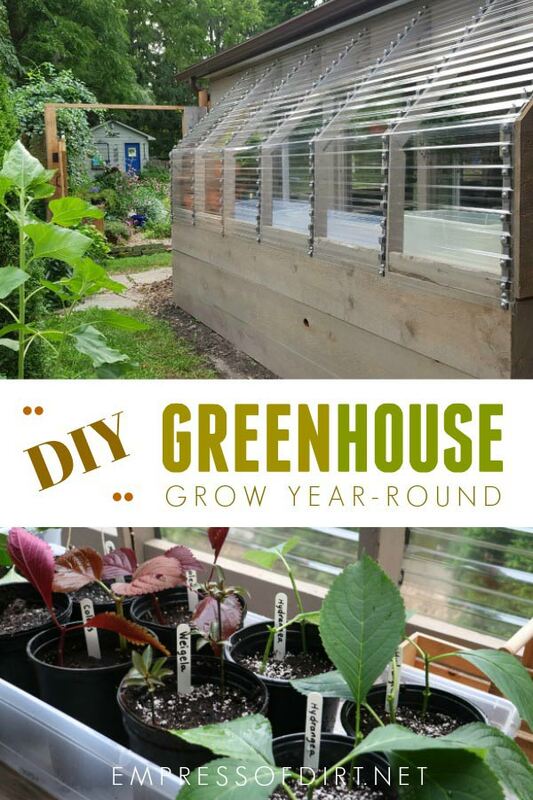 The main goal for this greenhouse to grow winter veggies like salad greens (mesclun mix), spinach, broccoli, Brussels sprouts, and kale in the cold months, and propagate cuttings in spring and fall. I’m expecting it to be too hot for summer growing, although I may end up testing a shade cloth to keep summer heat down as well. While I realize it’s very unlikely you will want to build a structure exactly as I have done here, I’ll walk you through the process in case you need ideas for your own unique building situation. And yes, I built it all by myself without any help. I have no particular skills, but I just love making stuff and learning as I go. There were quite a few challenges including the patio itself, which is not level or square, and some of the wood I purchased which was second-rate, and quite twisted. But, like any ordinary superhero, I managed to make it work. Here’s how the patio wall looked before I got started. I had covered it in screen and wood scraps a few years ago knowing I would be adding on a greenhouse at some point. 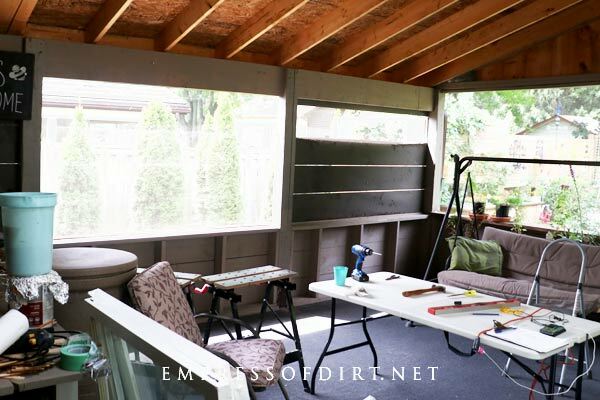 This area, unfortunately, directly faces a neighbour’s patio, so it’s not great for privacy without a wall like this. 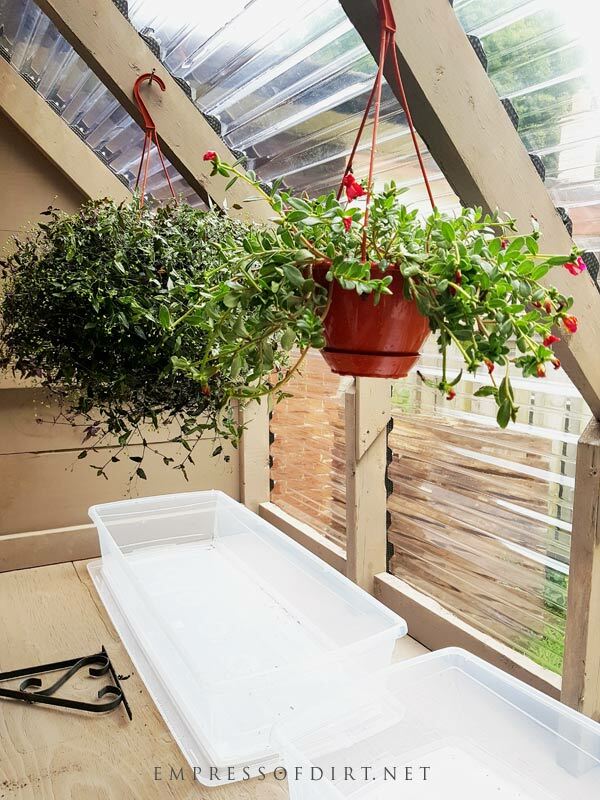 It would have been easier to make the greenhouse 4-feet deep instead of 3 (using Ana White’s plan), but I wanted to make it easy-to-reach in from the patio and 3-feet is a comfortable amount. Plus, a four-foot depth would have taken up too much space on the narrow pathway outside the structure. Wood: 2x4s, barnboard siding (10-inches wide, 1-inch thick), 3/4-inch plywood for table top and gussets, misc. 1x2s for batting and trimming windows. 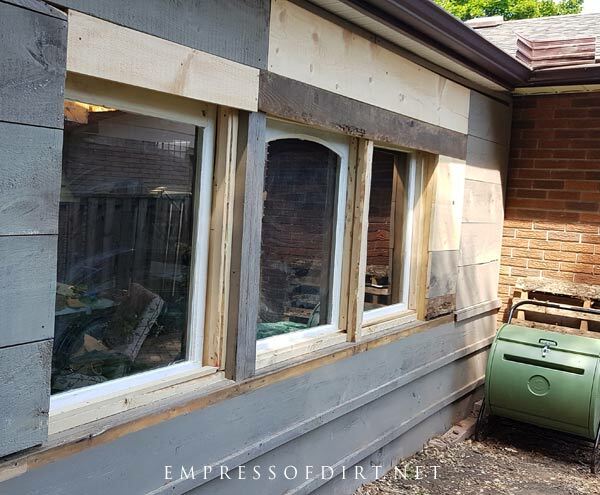 After removing the exterior wood on the patio wall, I stripped the paint off the old windows, caulked, primed, and painted them, and then framed them in place on the wall. 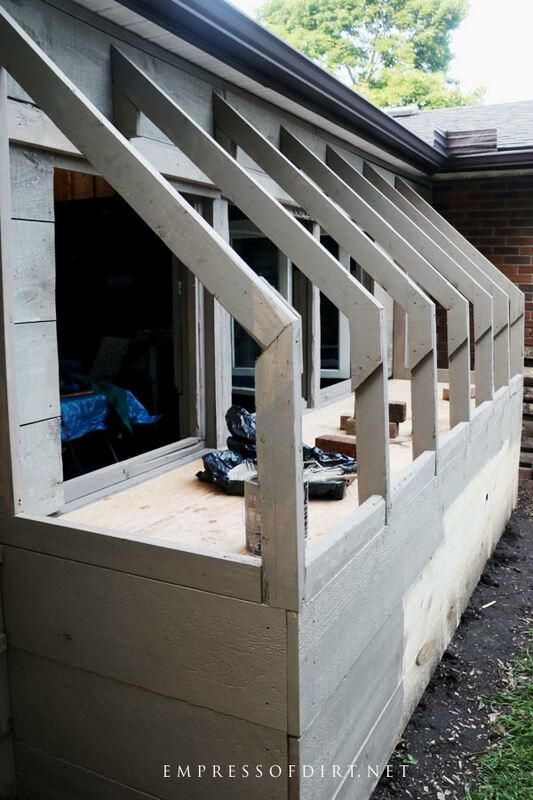 The windows were all different sizes and shapes, so I opted to line up the bottom edges and adapt with the rest. I framed in the windows so they would close fairly snug, hoping this will give me some control over the temperature in the greenhouse in the winter. The covered patio is open to the backyard (there’s just screen on the other open side), so it’s up to the greenhouse to retain daytime heat. We’ll see! 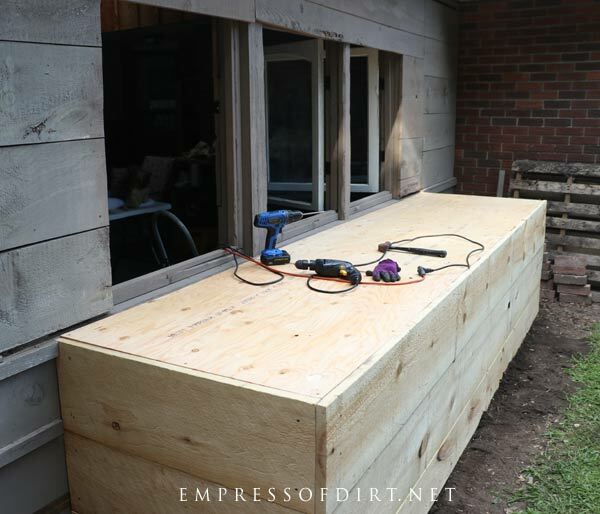 After the windows were set, I built the base of the greenhouse. Because I’m not sure how it will heat (or not) during the winter, I didn’t want to build anything inside the base just yet. Eventually, I could use the space to store rain water barrels, or add access panels from the patio and use it for storage. I may also want to add some insulation. But right now it’s just an empty box with table top. The heroic part of this build was figuring out how to make the base level and square. The patio wall actually drops several inches from one end to the other, so I just did my best to stay level-ish while blending in with the existing walls. I admit I got rather excited when my plywood sheets fit perfectly in the box and the whole thing measured according to plan. 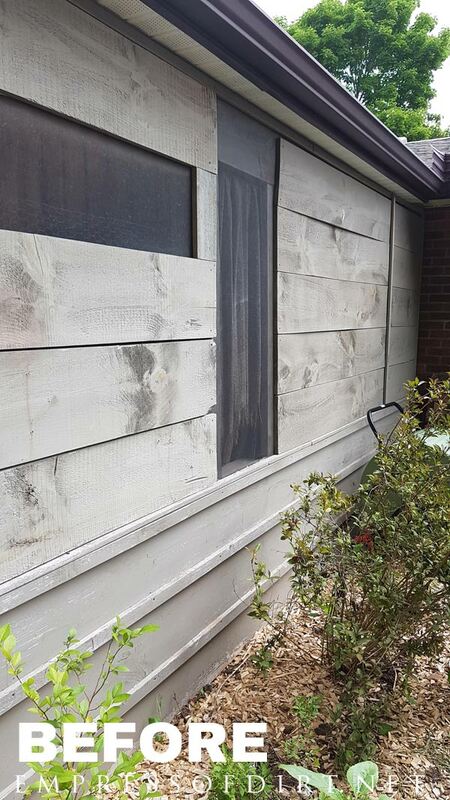 One blooper that came up later was, the barnboard used for the siding came in two different widths and thicknesses. Once I realized this, I had to move some pieces around so the thicker stuff was on the base and the stuff I planned for was up top. This is the part that is adapted from Ana White’s Greenhouse plan. In her plan, there are two 24-inch clear panels for the roof, and two for the sides. I had to change the angle of the trusses / supports so they would have just 3-feet of panels total (two on the slope, and one vertical). I’m proud to say I went against my desire to just keep building, and stopped and stained the wood as I went along. If I hadn’t, it would have been difficult (and in some spot, impossible) to do so once the panels were installed. The sun panels are lightweight and fairly easy to install. I thought I might need help with this part, but I managed everything on my own. I opted to use foam ridgeways (made to match the shape of the panels) along the support beams. There are also plastic ones available, but they cost a lot more. The instructions for the panels advise using roofing screws with rubber washers on alternate ridges, but I found I needed them on every ridge to form a seal. On the vertical parts, the roofing screws are drilled into the valleys. In this next photo, you’ll see a clear panel on the end of the greenhouse with wood up top. Ultimately, I want to have a clear window on this end (I think) but I have to find the right materials first. As it turned out, this temporary setup was letting a bit of water in during a big storm the other day, so I took the clear sides off and replaced them with wood for now. I’m pretty sure I will add some wire shelves inside eventually to increase the plant space. As I mentioned, my main aim is to grow winter veggies. The big bins in the photo (below) are for seed sowing. I drill drainage holes in the bottom and use the lids underneath as drip catchers. 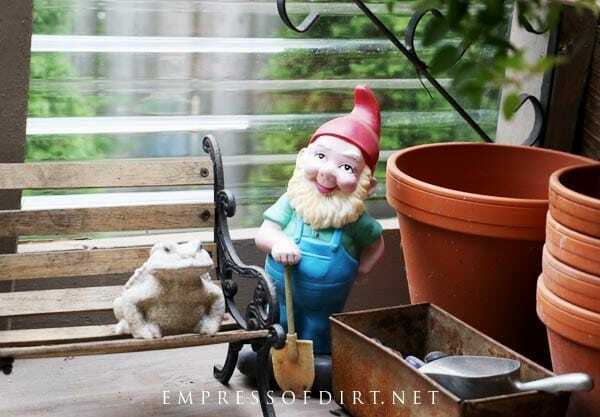 I also added some of my favourite garden riff-raff including the gnome and toad. 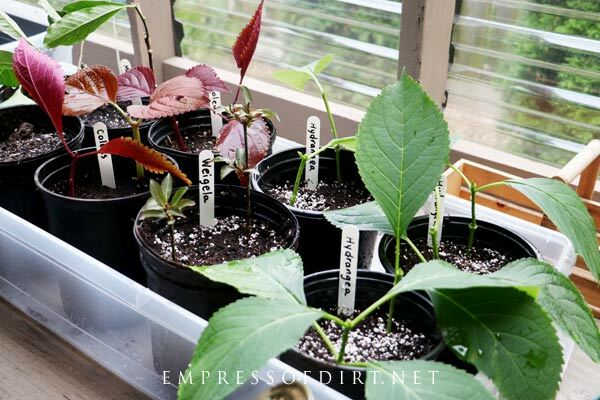 And the first project was to take softwood cuttings to propagate for new plants. The free instructions are here. I added a thermometer with humidity readings so I can start to learn how things are in the greenhouse compared to the conditions outside. If it goes as I hope, the temperature will stay above freezing even when it’s colder outside. If not, I may have to look at some solar heating options and/or insulation. I’m also mulling over automatic air vents, a misting system, and a fan for air circulation. Here’s a look again at the outside. There’s one knot-hole in the lower wood that I must block off before the chipmunk finds his way in! So far, I’m happy with the project. This winter will be the test period to see what’s possible for winter growing. 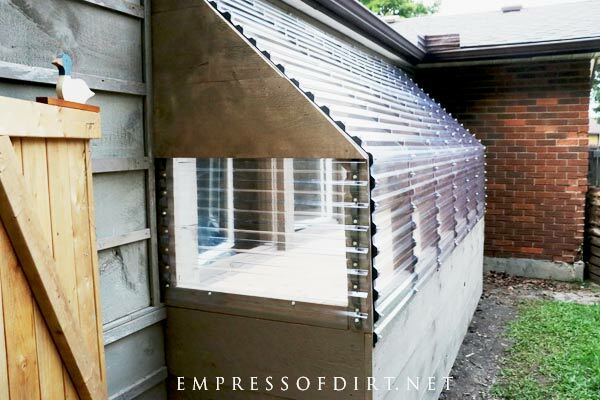 LOVE your new lean-to greenhouse, Empress!Nicely done!! Thank you, Barb! We are now Sisters in Greehousedom! You did such a great job on your greenhouses! I am impressed! Thank you, Christine. It took a lot of thinking to work but I’m really happy with the results.